Combine buffalo sauce and chicken in a small bowl and set aside. Combine alfredo, pasta, and about 3 oz of cheese and set aside. 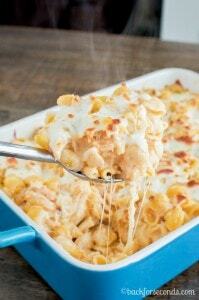 Spoon half of pasta into a greased 3 qt baking dish. Top with chicken and other half of pasta. Sprinkle remaining cheese on top. Cover with foil and bake 30 minutes. Remove foil and bake another 5-10 minutes or until cheese is bubbly. Remove from oven and allow to set several minutes before serving.